Hi, I’m looking for recommendations for any bike lights rear and front, looking for some really bright for my night rides. I found a brand called Nightprovision, but not sure if it’s good or you could recommend me any other brand. For a front light I use a Light&Motion Urban 350, which I find is plenty bright enough. They also make brighter lights but I really don’t see the need for city riding. For a rear light I use a few Chinese knockoffs that are surprisingly bright for the cost. If you want insanely bright my SO runs a Sygolite Hotshot 80, that literally blinds me at night if I’m following her. It’s great during the day, but much too bright at night in my opinion – way brighter than a car’s tail-light. Cygolite Expilion 850 front is what I use for my front and Cygolite hotshot pro 150 for the rear. Very bright, reasonable light modes. Not the cheapest, but my Cygolite gear has been reliable. Agree with cygolite. The upside for the front lights- batteries last a long time, very bright, a million different modes, and at least with my lights all the holders are universal for all the different lights, so I can move them around from bike to bike without worrying about it not fitting. Water proof, even when you accidentally tear off the rubber USB cover. Comes with a helmet mount too. Downside- takes a long time to recharge (slow charge rate plus large battery). Uses dumb mini USB plug (hello 1990s! maybe this has changed over the years?). With the swivel base occasionally the screw making it not swivel too much gets loose and I need to take 5 seconds to tighten it. Overall + outweighs – by far. I’ve been using a Fly6 for one of three taillights. It’s not cheap because it’s mostly a camera. I’ve owned three over the years. Biggest downside is that it’s difficult to mount anywhere other than the seatpost, a spot that is totally useless for me. I’ve rigged a mount to my rear rack consisting mainly of a bathroom sink J-pipe, zip ties, and a mesh bag oranges come in. For a front light, I cannot make any recommendations. I did invest $300 in a front dynamo system which operates both the front light and a second taillight. I’d be happier if I had some way of being able to recharge my phone or some other device off that little dynamo while in motion, but at least in terms of lighting, it gets the job done pretty well. This was almost two years ago, so look around for ideas. Spend the money, though, and expect to pay north of $250. You get what you pay for, and I got sick a very long time ago of replacing a $25 bolt-on light every couple months. I probably went through $150 of $25 lights. My third taillight is a clamp-on USB rechargeable from Sport-Ease World (link to Facebook page), which I have hooked to my helmet. I think this is an ideal place to stick a bright light. What type of dynamo do you have? I had one that ran against the rear wheel. It was an elegant design but really took more power on my part, enough that it was very noticeable over a long ride, but it did have a USB connector. I ended up bailing on it though. Do you have a hub dynamo? Seriously, though. Kindred installed it on my old Redline Conquest, and I transferred it over to the All-City when I got that a year ago. 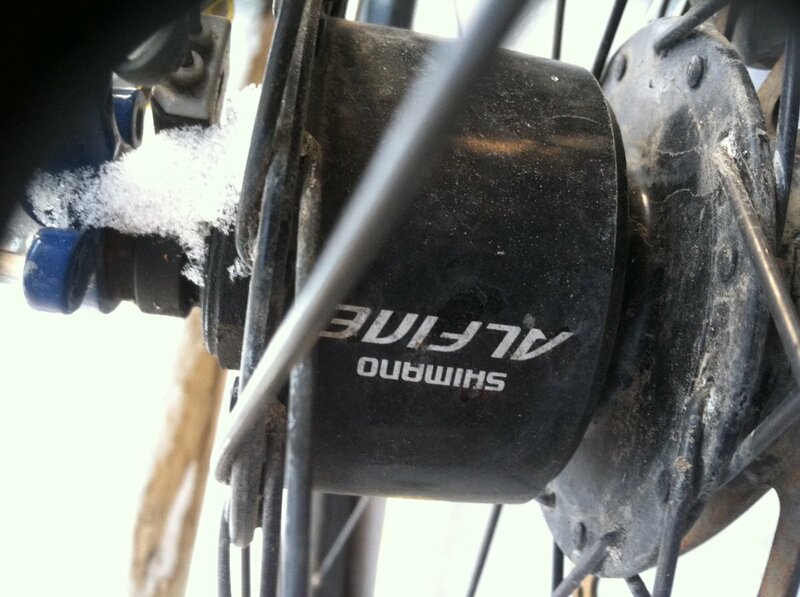 That’s one of those epicyclic dynamic hubs (ie no derailleur, right? ):: How do you like it? How does it change tension on the chain to give you different gears? Or is that on the front wheel? Also it is super expense but you can buy a Supernova Plug to get a USB plug on your headset. Got it. I assume you gotta disassemble the whole wheel since you’re replacing the hub? That looks like a lot of work (for a bike shop). Was it a lot to get it installed or did you get the wheel with the hub in it? You need new spokes as well (usually but not always) since flange on dynamo hub has a bigger radius. Some shops could cut old ones and put new thread on them. And another something to keep in mind. Those hubs are usually 32 and 36 wholes. This reply was modified 3 months ago by Mikhail. The drag article is really interesting. As they conclude, 7w isn’t a huge penalty in terms of instantaneous speed. However, that 7w could be a big penalty on a course with a lot of climbing, or over any long 5-8 hour ride, simply through the increase in muscle fatigue. Definitely trade-offs to be considered. I have a shutter precision PD-8 hub dynamo and a Supernova E3 Pure headlight/taillight combo. Very little noticeable drag. Works great. Cost roughly 300 for the setup, but I saved a few bucks by building the front wheel myself (It survived a sideways hit from a car at Bayard & Craig and didn’t need to be re-trued, so I guess I built it well. Also I didn’t die or get injured in the crash, so that was cool too).